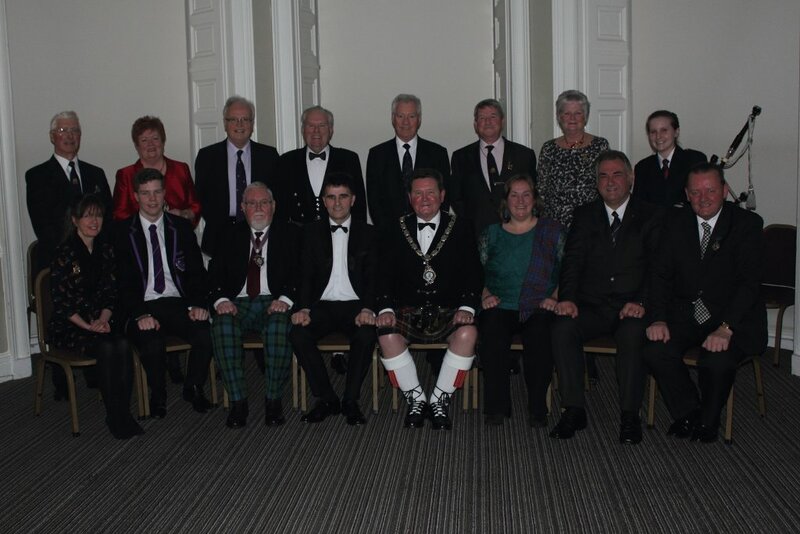 On Monday 26th January, 2015, members and guests of The Greenock Burns Club held their 213th Annual Celebration within the Tontine Hotel, Greenock. The top table guests were piped into the room by 15 year old Rachael McDaid, the granddaughter of our President. The proceedings were chaired by Bill McCready, President, who gave everyone a warm welcome. The President took a moment to pay tribute to George Bryden, a highly respected and much loved Past President, who passed away in October last year. 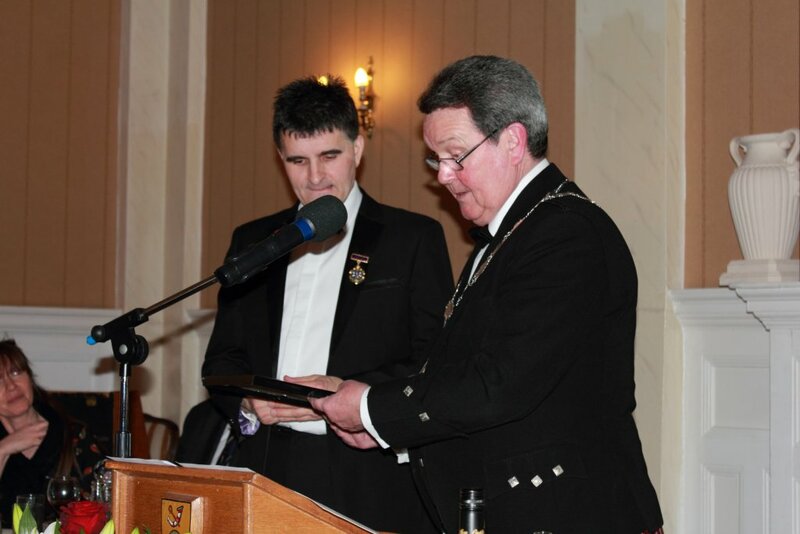 Alasdair Hendry, Honorary President, gave a stirring "Address to a Haggis", which caused some hilarity when a false “erm” was thrown into the company. After dinner Bill McCready introduced Joe Gatherer, accompanied on piano by Ian McCrorie MBE, who entertained all present with “Rantin’ Rovin’ Robin”. This was followed during the evening with “My Love She’s but a Lassie yet” “Willie Brew’d A Peck O’ Maut” and "Ae Fond Kiss". President Bill McCready then introduced the principal speaker for the evening – Mr. Angus Middleton, President of the West Kilbride Burns Club and a Past President of the Robert Burns World Federation, who proposed the Toast to the Immortal Memory of The Bard in his unique, entertaining and informative style. Just what we have come to expect from such an accomplished speaker. Angus received a hearty applause and standing ovation from all present. In accordance with tradition at The Mother Club, having proposed the Toast to The Immortal Memory of Robert Burns, Angus was later installed by Bill McCready as this year’s Honorary President. Angus expressed his delight at receiving such an honour from the Mother Club. Adam Piggot gave a very dramatical rendition of “Holy Willie’s Prayer”. He later gave his energetic rendition of “Tam O’Shanter”. The Toast to the Mother Club was proposed by Scott Renfrew, Head Boy at Clydeview Academy, who showed maturity beyond his years. His research into The Mother Club included Past Presidents and Honorary Presidents. An genuine and appropriate reply was made by Christine MacLeod, Senior Vice-President, who thanked him for his excellent Toast. The Toast to the Lasses was proposed by Andrew Gourley, who showed the usual humour. The Reply was given by Lesley Diack of the West Kilbride Burns Club, who more than stood up for the Lasses. Andrew and Lesley are both Past Presidents of the West Kilbride Burns Club and are currently Treasurer and Secretary respectively. A comprehensive Vote of Thanks was proposed by Jim Donnelly, Junior Vice-President, which included all who made a contribution to an excellent evening. The evening was concluded in the traditional manner with all of the company singing Auld Land Syne.